Companies today are tasked with managing and maintaining hundreds of policies in a climate of changing compliance mandates and evolving business objectives and strategies. Organizations across the globe face common challenges of ensuring (and proving) policy awareness and understanding, controlling rogue policies, keeping policies current, and more. 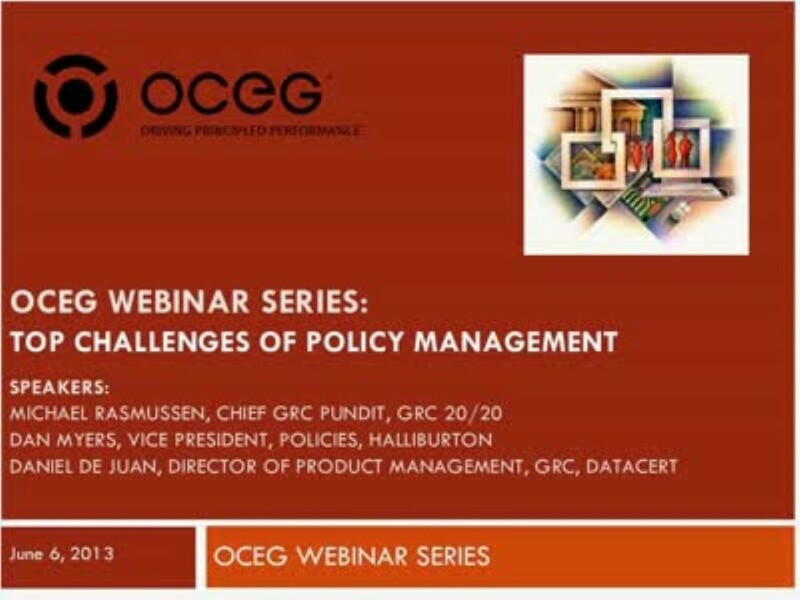 This webinar will discuss the top challenges of policy management and how to actively address each through improved process and with the aid of technology. Learn how policies are managed by Halliburton which operates in 80 countries with 80,000 employees. Hear the best practices of policy management from Michael Rasmussen, the internationally recognized pundit on GRC. Attendees will get practical advice and gain a better understanding of how to proactively manage corporate policies and what to look for in supporting technology. We have emailed instructions to access The Top Challenges of Policy Management Slide Deck to . Make sure the email arrives in your inbox: either add "support@oceg.org" as a safe sender to your email platform, or if you use Gmail, drag our email into your Primary tab.